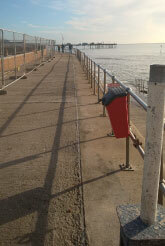 Working in partnership with the Environment Agency and Teignbridge District Council, Team Van Oord has successfully completed repairs to Teignmouth’s promenade and the area re-opened to the public in time for the Easter weekend. A sinkhole opened up in a planted area behind Teignmouth promenade on 30 December 2015 after Storm Frank caused waves to crash over the sea wall. Waves continued to lash the seafront as Team Van Oord carried out emergency work to repair the 15ft long by 6ft wide hole. The void was caused by washout through a failing section of concrete piled wall at beach level, which has probably been occurring for a number of years. The heavy rain and overtopping waves associated with Storm Frank caused the ground in the adjacent planter to collapse into the void. The initial hole was filled over the New Year holiday period but in carrying out this work the site team discovered that the void extended beneath the promenade slab for a length of 23m x 4m wide and, in places, and down to beach level (approx 3m depth). Investigative core holing in an adjacent car park indicated the existence of further voiding, and a GPR survey of the area was undertaken to determine the extent of this. To prevent further washout and stabilise the sea wall, sheet piles were driven in front of the failing concrete piles. Structural concrete was then placed between the sheet piles and the seawall, and concrete pumped through core holes to fill the void beneath the slipway and behind the failing concrete piles. During the work a granite ‘obelisk’ – thought to be a marker stone dating back to 1874 – was discovered on the beach. There are plans to reinstate the obelisk in its rightful place near the lighthouse. Conditions during the repair work were challenging, with continued storms and bad weather, and access for machinery only possible on the low tides around spring tides. Work on the beach was only possible for a few hours at a time, and often during the night. Thom Buxton-Smith, from the Environment Agency, said: “Despite these challenges we worked with Team Van Oord to complete the repairs quickly.